Hooked on Phonics Get Ready to Read Activity System: $18.95, Regularly $64.95! Right now at Amazon, you can get a Hooked on Phonics Get Ready to Read Activity System for only $18.95! Amazon has its list price as $79.99, but I went to Hooked on Phonic's site and found that it actually costs $64.95, so you're still getting a great deal on this! You'll get free shipping if your order is $25 or more, but it's easy to find super cheap items on Amazon to make up the difference. Ready to read? Hooked on Phonics invites beginning readers to explore words in a whole new way. 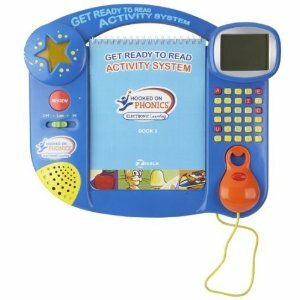 This portable learning system with carry handle features an interactive LCD screen, optical discovery mouse, skill-builder review button and tri-color LED. Kids can learn letter names, letter sounds, beginning spelling, rhyming, colors and shapes, and numbers. Includes bilingual mode. System comes with three unique activity books, plus fun stickers and built-in storage space. UL listed. Measures 13"W x 11.5"H.
Learn to read with hooked on phonics!